Do some cultural sightseeing at Palatine Hill and Piazza Navona. Your inner history buff will appreciate Vatican Museums and St. Peter's Basilica. Next up on the itinerary: contemplate the long history of Colosseum, explore the world behind art at Sistine Chapel, pause for some serene contemplation at Church of St. Louis of the French, and admire the striking features of Pantheon. To plan Rome vacation without wasting time, ask Inspirock to design an itinerary. Phoenix, USA to Rome is an approximately 15.5-hour flight. You can also do a combination of flight and train. The time zone difference moving from Mountain Standard Time (MST) to Central European Time (CET) is 8 hours. Traveling from Phoenix in April, things will get little chillier in Rome: highs are around 69°F and lows about 49°F. Wrap up your sightseeing on the 8th (Mon) to allow time to take a train to Florence. Deepen your sense of the past at sights like Cathedral of Santa Maria del Fiore and Palazzo Vecchio. You'll explore and learn at Galleria dell'Accademia and Basilica di Santa Croce. There's lots more to do: explore the world behind art at Uffizi Galleries, get a sense of history and politics at Museo Nazionale del Bargello, take in the views from Ponte Vecchio, and appreciate the extensive heritage of Piazza della Signoria. To see maps, where to stay, photos, and tourist information, go to the Florence day trip planning site . You can take a train from Rome to Florence in 1.5 hours. Other options are to drive; or fly. Expect a daytime high around 67°F in April, and nighttime lows around 50°F. Wrap up your sightseeing on the 11th (Thu) early enough to take a train to Milan. On the 12th (Fri), pause for some serene contemplation at Parrocchia SS Nabore e Felice, take in the spiritual surroundings of Duomo di Milano, then get advice or help at Pinacoteca Ambrosiana, and finally don't miss a visit to Piazza del Duomo. Keep things going the next day: admire the landmark architecture of Galleria Vittorio Emanuele II, then examine the collection at Castello Sforzesco, then pause for some serene contemplation at Basilica di Sant'Ambrogio, and finally take in the architecture and atmosphere at Chiesa dei SS. Pietro e Paolo. For other places to visit, maps, and more tourist information, use the Milan trip planner . Traveling by train from Florence to Milan takes 2 hours. Alternatively, you can drive; or take a bus. In April, plan for daily highs up to 66°F, and evening lows to 46°F. Wrap up your sightseeing on the 13th (Sat) to allow time to take a train to Venice. You'll explore and learn at Doge's Palace and Gallerie dell'Accademia. 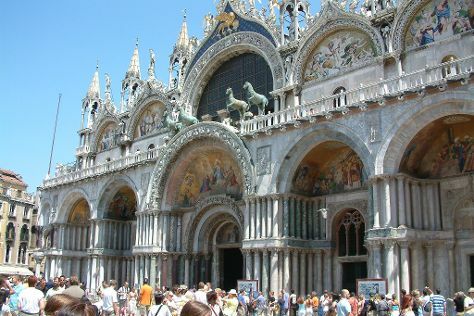 Your inner history buff will appreciate Basilica di San Marco and St. Mark's Square. Explore the numerous day-trip ideas around Venice: Padua (Scrovegni Chapel & Basilica di Sant’Antonio). There's lots more to do: don't miss a visit to Peggy Guggenheim Collection, contemplate the long history of Squero di San Trovaso, take in the architecture and atmosphere at San Giorgio Maggiore, and take in panoramic vistas at St Mark's Campanile. To see photos, more things to do, traveler tips, and more tourist information, go to the Venice journey builder site . You can take a train from Milan to Venice in 2.5 hours. Alternatively, you can drive; or take a bus. In April, daytime highs in Venice are 65°F, while nighttime lows are 49°F. Wrap up your sightseeing by early afternoon on the 17th (Wed) to allow enough time to travel back home.